If you don’t find your answer here, drop me an email, I’m happy to help. To compare licences, click here. I need help understanding the licence terms, do you have a simple guide to help me? Yes absolutely! Click here for a diagram overview which explains the basic terms of the licences. A Project is defined as a complete and cohesive undertaking that may result in one or more End Products. Any End Products included in the one Project must be directly related under a single concept. Should you wish to use the graphics in multiple projects, you can either purchase a new Standard Licence per Project, or an Extended Licence for unlimited Projects. Fonts may be used in an unlimited amount of Projects. What’s the difference between the items purchased under the Graphics Licence and the Pattern Licence? Resources purchased under the Graphics Licence may not be used on their own. This includes the patterns that form part of some of the graphic products. Conversely patterns purchased under the Pattern Licence may be used on their own in a stand alone manner. Please see next question for further clarity. What are the End Product requirements for the Graphics Licence and what is meant by an “Original Design”? End Products must be significantly different than the original Item purchased. You must combine the Resources with other creative elements to form an Original Design for products purchased under the Graphics Licence. An Original Design would be something you put time and effort into creating, ensuring the Resources are not the primary integrity/element of the Design, and you have combined the Resources with other original design work. The Resources should be used to facilitate your creative expression resulting in unique work different from the original Resource purchased. The resources may not be used stand alone. End Products may not be used or sold in a way that is directly competitive with the original Resource you purchased. Patterns purchased under the Graphic Licence may not be used stand alone. They may be used as backgrounds that form part of a wider design; as an overlay; or to fill a specific area within your Original Design. If you wish to use them stand alone, please contact me for a Pattern Standard Licence. End Products may not be sold or supplied in a way that allows for third parties to easily extract the Resources. How much does the Pattern Licence cost? The Standard Licence Pattern Licence is $65 per pattern. Why is the Pattern Licence more expensive than the Graphics Licence? 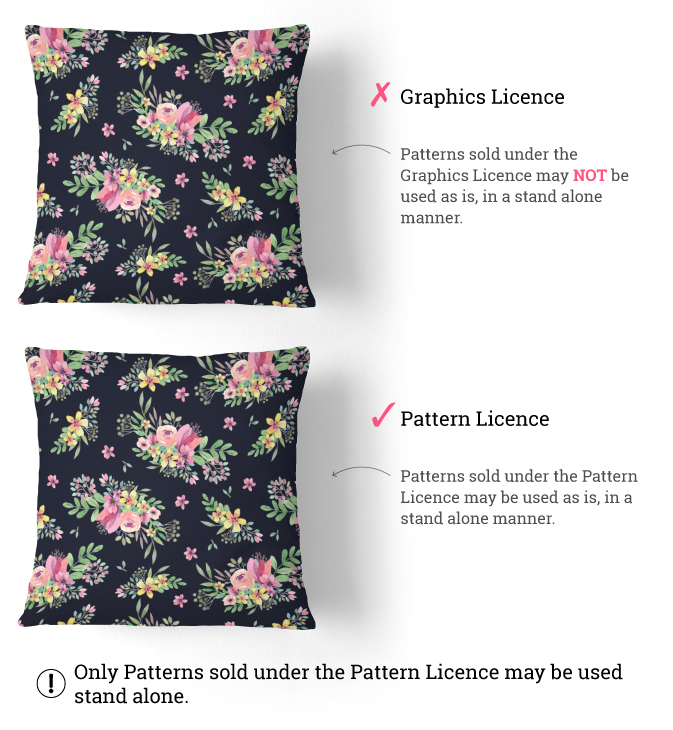 Unlike the patterns sold under the Graphic Licence that may not be used as is, patterns sold under the Pattern Licence may be used in a stand alone capacity. This means you can use the patterns as the main integrity of your end product. The price point of the Pattern Licence is in line with industry standard for royalty-free patterns of this nature. Should you have any questions regarding this licence, please feel free to get in touch. Do your licences allow for multi-users? All of my licences are single user licences only – meaning only one person can install them and use them. If you require a licence for a team, please contact me and I’ll set that up for you – I simply charge the product price times the amount of licences you need. A single user licence means that only the person who has purchased the product is licensed to use the Resources contained within the product. You are allowed to use these resources across 3 active devices as part of your licence. I’ve created an Original Design with the Resources, can I sell that design on Print-on-Demand (P.O.D) websites? Yes you may as long as you are selling a flattened design where the Resources cannot be extracted by a third party. For example a flat jpeg file is ideal. A layered PSD, vector file or transparent PNG file is NOT permitted. Fonts may NOT be embedded or uploaded to any P.O.D website, as this would allow for third parties to work with them who have not purchased a licence for the fonts. Can I use your Personalised Portrait Creator to create and sell portraits to my customers? Yes you may! But there are terms and restrictions that apply under both Standard Licence and Extended Licences. In short, you may use the portrait/s as part of a wider design (as per the licence requirements), like wall art prints for example, and sell up to 500 units of those prints. You may customise each print by swopping out the portraits for each sale, but the design and end product needs to remain the same. If you wish to use the Portrait Creator within a new design or end product, like an invitation for example, this would be a new commercial project, therefore a new Standard Licence is required. I recently created a blog post that’s more comprehensive in its licence explanation and requirements directly related to the Portrait Creator. Although it is addressing the photography industry, the terms apply to all end users. You can find it here. Should you have any questions at all please don’t hesitate to get in touch. Can I sell my designs using the Templett app? Please note fonts may NOT be uploaded and made available to end users within the Templett app. You may however convert the text to an image and use it within your flat design you upload. Can I use your graphics in my logo design and branding items? Yes you may under both the Standard and Extended Licence. You may use the graphics to create a company logo and any other branding related items like social media banners, design on your company website, company stationery, etc. 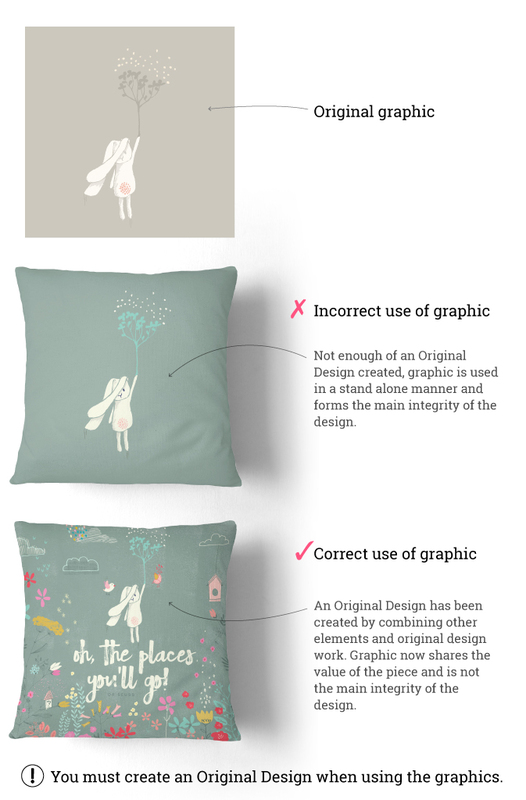 Please bare in mind you need to create an Original Design (see above) and you may not register the logo as a trademark – keep in mind that third parties can use the Item too, even in another logo. Can I sell a pre-designed logo to my customers in my online shop? Yes you may but again bare in mind you need to create an Original Design (see above) and you may not supply source files to your customer or supply it in a format that allows for easy extraction. The file needs to be supplied flat – .psd, .ai, and vector-based pdf files are NOT permitted. If you would like to supply a .png file, you would need to ensure the design of the logo doesn’t allow for easy extraction of the original Resource. You are allowed to provide your printer with source files for the sole purpose of printing your work, provided that once the printing has occurred, the supplied files are deleted from their system. You are not permitted to provide a layered file to clients. Instead they should be provided with the final, flattened designs. If your client requires access to source files to make additional changes to the design, including the a vector file for a logo, for example, they will require a license of the graphic/font for themselves. Some of your graphic products have lots of items, can I use the set in only One Project? Most of my products have many Sub-Items. Project limits apply to Individual Items within the product. This means that each Sub-Item within a product do not all have to be used in the same End Product nor the same One Project. You could split the product up into many Projects, you would only need a new Standard Licence if you wish to use the same Sub-Item in a different Commercial Project. If you purchase the Extended Licence, you may use the Items in multiple commercial Projects. Do I need to purchase an Extended Licence for every product I buy? For every one of my products you would like to use in an Extended Licence capacity (i.e. unlimited projects with unlimited sales), a separate License needs to be purchased per product. Are there any restrictions for fonts? To create stand alone phrase/quote art to sell on items like mugs, t-shirts, tote bags, stickers, etc. To embed in an ePublication without obtaining an ePub licence, please contact me for more info. I make digital scrapbooking kits that include stickers and papers, can I use your graphics in my kits? Yes you may as long as you adhere to the One project restriction, create a new Original Design (see above) on all your items including stickers, and files are supplied in a manner that doesn’t allow for easy extraction. For example, it is not permitted to use a resource on it’s own on a white background, the resource can easily be extracted and a new Original Design hasn’t been created. You may not include any source files or layered files, including, but not limited to PNG, PSD, AI, SVG or vector based PDF files. The graphics may not form the main integrity of the design or kit. May I digitize and sell embroidery files using your graphics? No, unfortunately you are not permitted to use the graphics in this way, end product of this nature are in contravention of the licence agreement. If I purchase an Extended Licence, do I own the copyright and can I redistribute and sell the items as clip art or change the graphics and license the new image? No you may not. Even with an Extended Licence, you cannot redistribute these images as clip art or claim the item as your own for resale or licensing in any shape or form. By purchasing a license, you are purchasing the rights to use the resources, the items are not sold to you. I retain all copyrights to these graphics, fonts and patterns. Help! The download of my purchase keeps stopping halfway. What can I do? Please verify that your Internet service plan allows you to download larger files, some products are over 3GB in size. Please make sure that your computer doesn’t disconnect from the network if/when it goes to sleep, or the download will be interrupted. This will result in a corrupted .zip file that may not unzip, a .cpgz or .part file (signifying an incomplete or partial download), or cache errors on your browser. Sometimes a quick clearing of the cache on your browser does the trick. Once you’ve cleared the cache, reload the download page and start the download again. It might be worth using a download manager to minimize any problems downloading large files and would allow you to pause/resume the download. Make sure that any virus software, firewall, or ad-blocker you’re running is not preventing the download from completing. Sometimes overzealous firewalls or even your corporation’s IT regulations can cause issues with downloads on our site. Finally, if you continue to experience issues, please do get in touch so that I can further assist you! First, close any open applications. Newly installed fonts may not appear in your font menu if you ignore this step. For older versions of Windows, you can find info here. Once you’ve installed the font, relaunch your application and find the new font in your font menu. What software do I need to use your products? Each product lists the software requirements which you can find in the side bar of the product. Please be sure to check your software compatibility before purchasing the product. Most of my products include both vector and raster based files. If a product specifically lists the actual software needed, this is an absolute requirement, meaning, the set won’t work in other software not listed. If the set lists PNG and JPEG files included, these can be imported into most programmes, even MS Word, for basic design work. I recommend using the free online software picmonkey.com to create more advanced designs with the PNG files. I don’t have a Paypal account, can I still purchase your products with my credit card? 1. 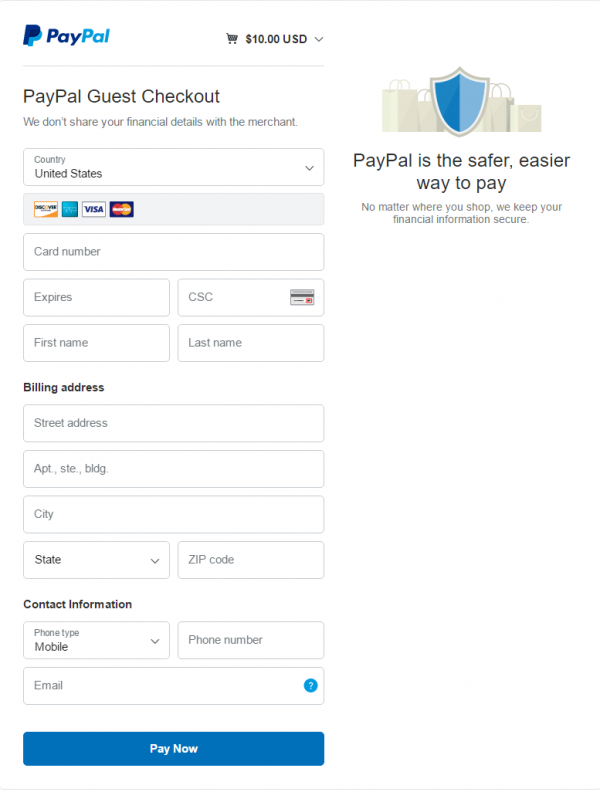 At checkout, when redirected to PayPal select the option to pay with a debit or credit card – this usually shows up underneath the log-in prompt. 2. A new window will appear, fill in your credit card and billing information, as well as an email address so PayPal can send you a receipt – depending on your country, detail requirements might be different. 3. 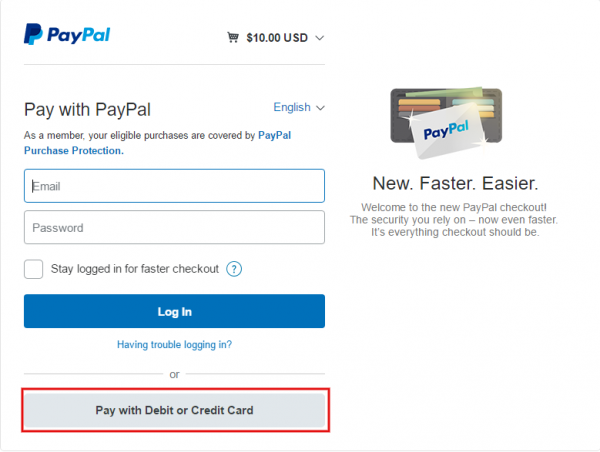 Once you click Pay Now, you will be prompted to create a PayPal account, you can just decline if you don’t wish to create one. Please note: If PayPal is not accepting your credit card, it may be that you already have an account linked to your card’s information, preventing payment with it without logging in. Furthermore, it may be that your country doesn’t support this kind of payment. Do you take on commission work? Possibly. I love creating something special for my clients where the project fits my aesthetic and is within timeframes that are achievable based my current work schedule. Feel free to pop me an email with your requirements, timelines and any other relevant info that you think will be helpful, I’d love to hear from you. PLEASE NOTE: Unfortunately at this stage I don’t take on any branding and logo design work, or custom pet portraits. How do you create your instagram videos? If I’m directly filming myself drawing etc, I use my camera video function then finish off the video in Adobe Premiere Pro. If it’s a screen recording showing how I work, then I use Quick Time Player to record my screen and finish off the video in Adobe Premiere Pro to speed up, or add audio and edit etc. And if it’s a combination of images, I take screen shots of my images one by one, then combine them in Adobe Premiere Pro to speed up and edit etc. Do you draw on paper or digitally? Almost all my work starts with pen or pencil on paper. Depending on the look I want to achieve, I either scan my original sketches in and clean-up in Adobe Illustrator, or refine my sketches on paper first, then vectorise in Adobe Illustrator. I sometimes use Procreate to create texture and shapes. All my watercolour work is created traditionally (paint and brush on paper), then scanned, cleaned and background removed in Adobe Photoshop. What gadgets and software do you use in your work? I work mostly in Adobe Illustrator on a Mac, and Procreate on my iPad Pro. I use AstroPad to pair my iPad with my Mac and use the precision of the Apple pencil to do a lot of vector and Photoshop work. The iPad Pro I have is a 2016 9.7 inch. The screen protector I use for my iPad is the amFilm Matte Screen Protector which you can buy from Amazon.